The very strict safety standards, which must be guaranteed in a railway system, make the testing of all electronic components a unique and challenging case study. Software-based self-test represents a very attractive test solution to cope with the problem of on-line and off-line testing of microprocessor-based systems. It makes it possible to deeply test hardware components without introducing extra hardware and stressing the system in its operational condition. 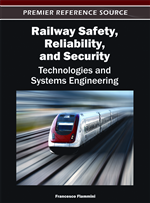 This chapter overviews the basic principles of software-based self-test techniques, focusing on a set of best practices to be applied in writing, verifying and computing the final test coverage of high-quality test programs for railway systems. Safety-critical railway systems are developed according to the highest Safety Integrity Level SIL 4 (IEC, 2011), as imposed by the European Committee for Electrotechnical Standardization (CENELEC) in the standards applicable to the railway industry (CENELEC 50126, 50128, 50129, railway applications standards available at http://www.cenelec.eu). These standards cover the safety management of electrical, electronic, and programmable systems throughout their lives, from concept to decommissioning. They bring safety principles to the management of systems and safety engineering to their development. In the last few decades, the control and automation of the railway systems have been increasingly engineered around microprocessor-based architectural solutions that, consequently, started playing a crucial role in the safety, reliability, and security of modern railway infrastructures. The design of the testing mechanisms that have to guarantee the correct behavior of a microprocessor-based railway system, their organization and implementation are unique and challenging case studies. In the UK, the first document addressing safety issues in railway systems is the “Regulation of Railways Act” of 1889. Although it was published a lot earlier than the advent of microprocessors, it introduced a series of requirements on matters such as the implementation of interlocked block signaling and other safety measures motivated by a railway disaster in that year. One of the evolutions of this document is the “Railway Safety Principles and Guidance”, produced by the Health and Safety Executive (HSE) for use by organizations wishing to obtain approval for new or altered works, plants and equipment under the Railways and Other Transport Systems Regulations in 1994 (HSE, 2011). Although these manuals have been now replaced, they set the standard for basic guidelines related to safety measures and may help developers in getting a clearer idea of the challenges that need to be addressed when designing testing techniques for railways applications. (41) Design and construction of mechanical or relay interlocking to inherently ‘fail-safe’ criteria are required. Programmable electronic interlocking should be designed to composite or reactive fail-safe criteria, using techniques such as redundancy, diversity and self-testing […]” (pp. 14). The signaling system should continue to provide for safe passage of trains permitted to run under degraded conditions. The factors for consideration should include: (a) design for ‘graceful degradation’ so that correctly working parts of the signaling system may continue to be used safely; (b) protection from failure modes creating unsafe situations; [...]” (pp. 34).